My travel mate, who has been going in and out of Russia since the Soviet days in 1983 and lives part-time in St. Petersburg, commented how the taxi lane outside of the main airport in Moscow had in previous years been madness, with a glut of unofficial taxi drivers mixed in with the official ones. Competition over potential customers would sometimes result in fistfights. However, there was no sign of such anarchy when we rolled our luggage out into a surprisingly bright sunny day after spending approximately 15 hours crammed onto three airplanes. Only official taxi drivers were seen dotting the lane as regulation of the business has now kicked in. Our driver deftly wheeled us around the city to our hotel — and I say deftly because it looked like driving in Moscow would be pretty stressful. A good stretch of highway near the airport had road signs in English beneath the Russian. 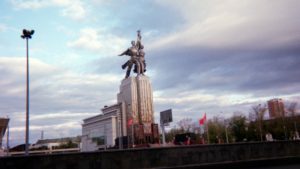 We made our way past a combination of new, colorful high-rise apartment buildings, dreary square apartments from the late Soviet era, and modern Russian commercial outlets. One couldn’t go far without seeing a good number of western and Japanese companies as well: BMW, Mercedes, Toyota, McDonald’s, Levi’s, Michelin, and TGIFridays. Parks and greenbelts could be seen throughout the city. At one point, we passed a lovely blue pedestrian bridge. I began to notice the mix of old blue and white buses that ran with cables attached and those that looked very much like modern buses one would see in the San Francisco Bay Area; only the image of the distinctive onion dome cathedrals painted on the side would remind you that you are in Russia. Most of the vehicles on the road were German or Japanese with a smattering of Lada’s here and there. As a first-time visitor, I was struck by the fact that, in many ways, this large bustling city looked like any major American metropolis. One amusing distinction was the street-sweeping trucks that mingled with the regular traffic, spraying blasts of water onto the roads as they went. Other motorists could get a free partial car wash during their commute. The streets are clean but the smell of gasoline was pungent in the air. Evidence of ongoing road and building improvements was visible everywhere in the form of workers, their affiliated machinery and scaffolds. 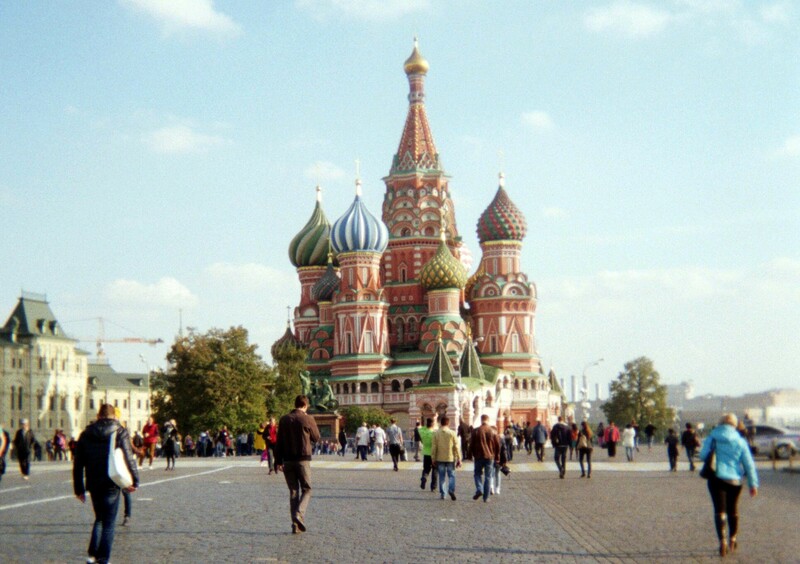 On our second day, we toured Red Square and saw the onion-domed cathedrals in their glory of gold and pastel colors. The enchanting hues of St. Basil’s Cathedral evoked the surreal feeling that I had been deposited into the middle of a children’s story book. We also passed by the squat building below the Kremlin Wall that contains Lenin’s Tomb where people can view the Bolshevik leader’s embalmed remains — a preservation process that was so sophisticated it is said that he appears to simply be sleeping. It wasn’t open on the day we were there, however. 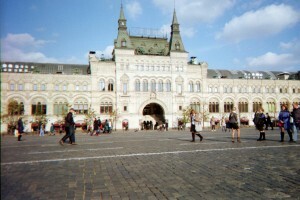 On the other side of the square is the world-famous GUM shopping complex. We stopped at an outdoor restaurant and had coffee before meeting up with a Russian executive who works for a major American corporation in Moscow. (I’ll be writing more about that later). Getting to Red Square and back from our hotel prompted us to take the Metro, which puts the BART system in the San Francisco Bay Area to shame in terms of interior design. I was inside three stations and all were designed somewhat differently, but all of them had features of classical beauty, such as Roman arches, chandelier lighting, and lovely tiling on the walls. Across the street from our hotel is the Soviet Exhibition of Economic Achievements, a major Stalin-era project that consists of elements of beauty, kitsch and creepiness all at once. There are large ponderous buildings in what some describe as a Neo-Babylonian style, replicas of rockets and airplanes, and a carnival ferris wheel that is brilliantly lit up and turns at night. Next to that is the Gagarin Monument, honoring the first Russian cosmonaut in space, Yuri Gagarin. 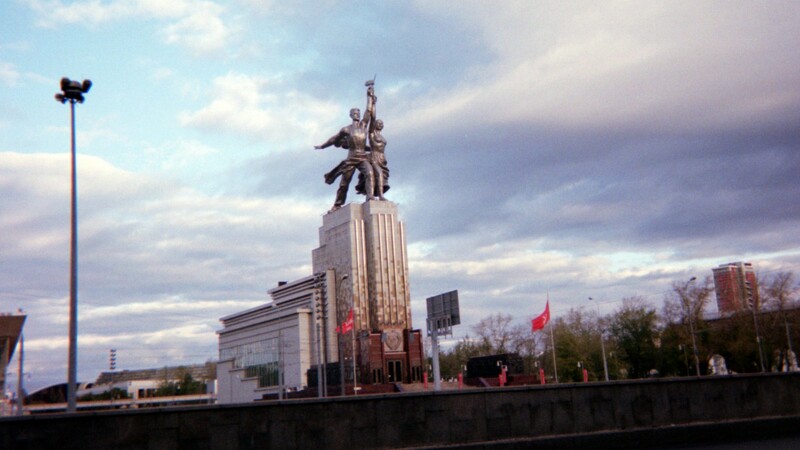 Further down in the opposite direction is the monument honoring the Soviet workers — a man and woman side by side, reaching up and out in triumph. And in front of the hotel is a statue of Charles DeGaul, the independent French leader who eschewed NATO membership and called for a Europe stretching from Lisbon to Vladivistok (in Eastern Russia). I was sad to leave Moscow but looked forward to the next stops on our itinerary: Simferopol and Yalta in Crimea.